A good night’s rest is essential to your overall health. Sleep apnea interferes with your ability achieve deep sleep. At New Age Dentistry in San Ramon, Dr. Sherry Steinmetz has the expertise to treat this condition and collaborates with local physicians for comprehensive sleep apnea therapy. Schedule an appointment today to experience this interdisciplinary approach and see if sleep apnea dental appliances are right for you. Sleep apnea’s side effects are mainly characterized by the cessation of breath, causing the patient to awaken abruptly. This condition increases patients' risk for heart disease, obesity, high blood pressure, and other serious health concerns. Sleep apnea is difficult to diagnose since it can only be detected while a patient is sleeping. Comments from loved ones about excessive snoring and concerns about their quality of sleep are usually the first red flag for many. Health professionals at sleep clinics diagnose this disorder by monitoring a patient’s breathing while asleep. At New Age Dentistry, our staff is able to assess symptoms of sleep apnea and refer to San Ramon sleep apnea specialists for a full diagnosis. The standard treatment for obstructive sleep apnea is a continuous positive airway pressure machine. However, not every sleep apnea case requires a CPAP appliance. Patients with less severe cases can be fitted with oral appliances that are far more comfortable, allowing them to breathe, speak, or even have a sip of water while wearing the device. At New Age Dentistry, Dr. Steinmetz offers SomnoDent MAS for patients who cannot tolerate CPAP machines. 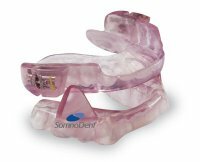 These innovative appliances resemble an athletic mouth guard and help reposition the jaw to create a larger opening in the airway when sleeping. They are smaller, easier to adjust, and extremely durable. For those suffering from more extreme cases of sleep apnea, the SomnoDent has been used in combination with CPAP. Sleep apnea can be treated with custom appliances and care from our dentist. If you live in the San Ramon area and are interested in learning more about sleep apnea or have been told that your snoring is disruptive, contact Dr. Sherry Steinmetz at New Age Dentistry today!